AUTHOR INFORMATION: Catherynne M. Valente is the author of over a dozen books of fiction and poetry including The Labyrinth, The Orphan’s Tales, Palimpsest, The Habitation of the Blessed and The Girl Who Circumnavigated Fairyland in a Ship of Her Own Making. Her work has been awarded the James Tiptree, Jr., Mythopoeic, Andre Norton, and Lambda Literary Awards, and has also been nominated for a Hugo, World Fantasy, and Locus Award. ABOUT DEATHLESS: Koschei the Deathless is to Russian folklore what devils or wicked witches are to European culture: a menacing, evil figure; the villain of countless stories which have been passed on through story and text for generations. 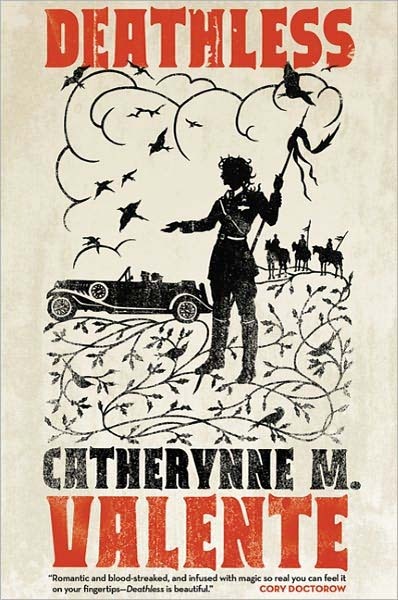 But Koschei has never before been seen through the eyes of Catherynne M. Valente, whose modernized and transformed take on the legend brings the action to modern times, spanning many of the great developments of Russian history in the twentieth century. CLASSIFICATION: Weaving together fairy tales and history, Deathless is kind of like Pan's Labyrinth, if it was told by Hayao Miyazaki and Neil Gaiman. Highly recommended for fans of adult fairy tales, Russian folklore, and Catherynne M. Valente. FORMAT/INFO: Deathless is 352 pages long divided over a Prologue, six Parts, and thirty numbered/titled chapters. Narration is in the third-person, mostly via the protagonist, Marya Morevna. Deathless is self-contained. March 29, 2011 marks the North American Hardcover publication of Deathless via Tor. Cover artwork is provided by Beth White. Presented mostly in the form of a fairy tale, Deathless is the story of Marya Morevna, the fourth oldest and fourth prettiest daughter who, at “sixteen years of age, with seventeen’s shadow hanging heavy on her every tear”, meets Koschei the Deathless, who whisks her away to his home in Buyan in the Country of Life. Now, I’m no expert on Russian folklore—in fact, apart from Baba Yaga, I have very little familiarity with Slavic mythology—but what I could gather from researching Koschei online, Deathless remains fairly true to the original tales including Koschei’s death hidden from his body, birds turning into men who marry Marya’s sisters, an Ivan who steals Marya away from Koschei, a role played by Baba Yaga, and Koschei’s fated demise. Of course, there are plenty of deviations like Koschei depicted as a tragic hero rather than an evil villain; the historical setting, which includes Leningrad during World War II; Ivan and Marya not being brother and sister; and the war between the Tsar of Life and the Tsar of Death. Even with all of the changes made to the original tales however, Catherynne M. Valente manages to keep her novel firmly rooted in Slavic mythology as evidenced by the appearances of domovoi (house imps), leshy (forest imps), vila, rusalka, firebirds, Likho, Viy, Gamayun and more. 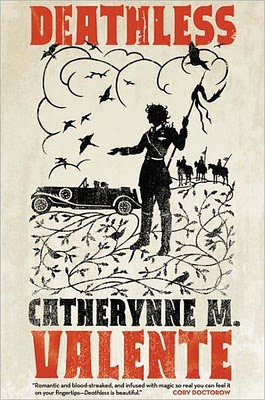 At the same time, Catherynne M. Valente’s boundless imagination is on full display with a rifle imp and a factory where girls who never age weave lifeless cloth soldiers for battle against the Tsar of Death some of the more inventive material in the novel. Personally, what I loved most about Deathless was the fairy tale aspect, specifically the author’s frequent use of the “rule of three”: the three birds who turn into men and marry Marya’s three older sisters; the three tasks that Marya must perform in order to gain Baba Yaga’s approval to marry Koschei; the three chyerti friends who aid Marya with her tasks; the three gifts Marya receives from her sisters when she and Ivan are fleeing the Country of Life; and so on. Even when Catherynne M. Valente is not employing the rule of three, most of Deathless still possesses a charming fairy tale-like quality that accounts for much of the novel’s irresistible appeal. Unfortunately, from the moment the story shifts to Leningrad at the start of Part Four until the book’s conclusion, it felt like I was reading a different novel altogether. The subject matter became darker and more depressing, the pacing waned, and the fairy tale qualities were less enchanting. To top it off, the ambiguous ending was hardly the payoff that I was expecting. Now don’t get me wrong. I have nothing against fairy tales with dark themes, adult content or unhappy endings—on the contrary, I enjoy such tales very much—but in this case, the last three Parts of Deathless just didn’t fit with the rest of the book. The end does slow down a little, and then there is that just plain strange chapter with the Tsar of Birds. The way I interpreted those darker, slower bits at the end was Marya is still stuck in this story, and she knows how it needs to end, so she's kinda of just sitting around waiting for the end to find her. If most of the book was the cardio part of the work out, the end is kind of the cool down. I agree with the comments about the end--I personally don't know what to make of it. But, like reading a good poem, there is something compelling in it, something fascinating that makes you come back even if you don't understand it. I couldn't not agree more about the ending. The last three parts almost waned and I had to check that I was still reading the same book.